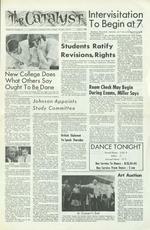 Three page issue of the student produced newspaper. lntervisitation To Begin Published by Students of New College, Sarasota, Florida July 8, 1966 Volume II, Number 39 "'1'1 President Elmendorf yesterday set 7 am as th New College Does What Others Say Ought To Be Done "We are doing a lot of things everybody else says ought to be done but can't do because of various restraints," President John Elmendorf told The Catalyst yesterday. He said this became apparent during the Danforth Foundation Workshop Second-year student John Cranor and first-year student Cheryl Hess appear absorbed in the intricacies of the ballot on constitutional revision and the adoption of a "bill of rights." for intervisitation. C Enforcement of the recently revised rules will begin tonight. Elmendorf told The Catalyst the new hours, as set by the administration, had actually gone into effect Tuesday. No official Students Ratify Revisions, Rights Studentsratifiedthe constitutional revisions and the Bill of Rights Wednesday in an "overwhelming" vote, according to Supervisory Committee chairman Kenji Oda. Oda, in reporting preliminary results to the Student Executive Committee after the polls closed, termed the vote "so overwhelming there is no doubt. 11 The final tally listed 104 votes for accepting all the proposed revisions and lll votes for all the articles of the B i 11 of Rights. There were othervotessplit among the various articles on both sections of the ballot. Only two students voted against both the entire constitutional revision and the Bill of Rights. They will not be retroactive, however. Necessary changes in the SEC's modes of procedure will be made shortly, pending a report by the Constitution Study Committee to the SEC. The report is scheduled for Wednesday. notification was published by the administration, however, and there was some confusion during the week about the ending time. Calling the subject of intervisitation, and especially the question of a morning hour, ''boring, Elmendorf and Dean of Students Robert Norwine agreed tole ave the beginning time unchanged. Proctor Arthur Ohmes said last night he had been told by Disciplinary Committee chairman Bill Chadwick to begin enforcing the new hours tonight. Intervisitation will end at 1 am tonight because of the weekend. Beginning Sunday intervisitation will terminate at ll am on weeknights. Elmendorf said notification of the official beginning of the earlier hours was not forthcoming before Tuesday because he had been out of town. He cited, however, his earlier statement saying intervisi tation would begin "no later" than July 5. Afavorablevoteby a majority of all students was necessary for passage. The fewest favorable votes required for such a majority was approximately 75. A total of 125 ballots were cast. According to the SEC the changes will go into effect immediately. Room ( 'heck May Begin During Exams, Miller Says in Liberal Arts at Colorado Springs, Colo., which was attended by dele gati:>ns from twenty liberal arts colleges in the United States and Japan. The workshop, which ended Wednesday, consisted of seminars whichprovided the participants "a chance to talk about what's new and exciting in education," Elmendorf explainPd, "<>nd wh<>t 11ew schools could learn from old schools and vice versa. John s o n A ppoi n t s Study Committee Assistant Dean Arthur Miller told the Student Executive Committee Wednesday end of the year room checkout "preswnably" may have to begin during exams. He said the check would "maybe" begin Friday, July 29, at the end of exam week. Miller read the committee a statement written by Claude Schutter, of the Planning Office, defining "normal wear and tear" to rooms for which students will not be charged. Miller said the guidelines are virtually the same as those used last year. to move before that time in special cases. In separate disOlSsion Miller told the committee parking regulations are "supposedly" being enforced. He said they also apply to motorcycles. Cycles and scooters parked on the highway side of the dorms or on the south side are being reported, Miller added. He said the proper parking place for the vehicles is in the bicycle parking area. Ten of the schools represented were relatively new schools, while the remaining ten were relatively established colleges, some of them members of large universities. "We're way, way out in left field," Elmendorf said in comparing New College to the other schools. Dr. John French, College Examiner and one of the conference delegates, said New College "seemed" to him to arouse the most interest of the schools represented. Among the topics discussed were methods of examination and eval-French Elmendorf uation and student counseling systems. The nature of comprehensive examinations and their distinction from end-of-course exams was the subject of extensive debate, French said. Also, he said, there were discussions of how the counseling system here could be improved. He said some faculty members who are poor counselors might be excusedinthefuturefrom counseling duties. Other suggestions for improvement include more careful assignment of faculty advisors to students and the institution of periodic counseling sessions for all students. French added New College has an advantage over other schools in that it is able to change far more easily than other schools. Most other schools are tied to some sort oftradition which makes extensive change difficult, he said. Members of the New College delegation were: French; Dr. Peter Buri, chairman of the natural sciences; Dr. Arthur Borden, chair man of the humanities; and Dr. Rollin Posey, chairman of the social sciences. Elmendorf attended part of the conference as an auditor. President Lyndon Johnson Saturday named a 20-member committee to conduct a thorough study of the selective service system and make recommendations to him by January 1 for its reform. This action came just two days after the Defense Department released a report of a similar study ordered by President Johnson in 1964 and completed in 1965. The Pentagon report suggested a nwnber of changes in present draft practices, including taking 19 and 20-year-olds first instead of those approaching the cut-off age of 26, but some members of Congress complained the study 1 eft some problems unsolved. No idea, including a possible draft lottery and national service by women in nonmilitary fields, will be e xc 1 ud e d from the new committee's area of study, Press Secretary Bill D. Moyers said. Johnson named Burke Marshall, fonner assistant attorney general in charge of the civil rights division of the Justice Department, to head the group, to be known as the National Advisory Commission on Selective Service. Members of the commission are predominantly educators and business executives, but the list includes a priest, a judge, social scientists, public service workers, former armed forces officers, and the former director of the Central In te lligen c e Agency, John A. McCone. Chairman Marshall is presently general counsel and vice president of International Business Machines. The Pentaeon's study indicated little hope for the possibility of eliminating the draft for at least a decade. Also, according to the report increased pay and fringe benefits would have a surprisingly small effect on the volunteer rate. Basis for this conclusion is a recent survey of military-age youths, 4 per cent of whom said they would enlist if military pay were brought up to civilian levels. The main finding of the report, however, was that both civilians and combat commanders prefer draftees of around 19 and 20 years of age. power pool for one year at the expiration of the deferment. In all cases, if a person were not drafted within one year of the time he was placed on high priority, he would be shifted to the bottom of the pool. Brit ish Diplomat To Speak Thursday A 35-year veteran of the British Foreign Service will speak Thursday after dinner at College Hall. Lyndon Clough, a long-time friend of President Elmendorf, has agreed to come to Sarasota to speak about Nepal and its relationship to contemporary culture. Cough has been stationed in the tiny Asian nation for the past five years. The talk, open to the general public, will begin at 7 pm in the Music J;toom. Elmendorf indicated Clough would "probably" bring slides and use them in his presentation. House Committee chairman Steve Waterman will publish, in conjunction with Planning Officer RalphStyles, an information sheet about the room check and chargeable damages. The check will be by a member of the buildings and grounds crew and a member of the student gov ernment. They may operate in two teams to speed up the process. Miller said students will be requested not to begin moving to different rooms until noon on Saturday, July 30. He indicated, however, students may be granted permission SEC chairman Steve Hall reported a list from which the orientation committee will be selected had been compiled and the committee should be named shortly. Proxies at the meeting were Mike Cassell for Ray Enslow, Leo Peruzzi for Karle Prendergast and David Pini for David Allen. All other members were present. DANCE TONIGHT Forma l Dance 8 : 30 -11 Buffet -11 Informal Dance 12-2 Bus Service To Dance 8:15,10:45 Bus Service From Dance -2 am Art Audion Some one hundred blQck-andwhite art prints will be auctioned to members of the college community Wednesday at6:30 pm in the Music Room of College Hall. The prints were given to the college by Dr. Fred Licht, professor of art history here last year. Proceeds of the auction will go to the library. According to Dr. Corinne Wilson, librarian, the Dutch auction system will be used. Under this system, a base price is set for each article to be bid upon and an alarm clock is set for a secret length of time prior to each bidding. The Pentagon suggested the present de ferment sc he dul ebe preserved for the most part, but that all eligible men be available for one year sometime b e t we en the ages 19 and 34. Under such a plan, youths would be high priority at probably the age of 19. Those who go to college or use some other temporary deferment would be placed in the man-At Concer t' s End Each time a person bids he must pay the difference between his bid and the previous one (or the base price), whether he wins or not. The highest bidder at the moment the alarm goes off wins the article being bidded on and pays the bid differences he has incurred plus the base price. Paul Wolfe signals the Summer Music Festival Chamber Orchestra t o rise and share in the enthusiastic applause of the audience. The musicians were given a standing ovation at the conclusion of Sunday's faculty concert, the seventh and last of the series.